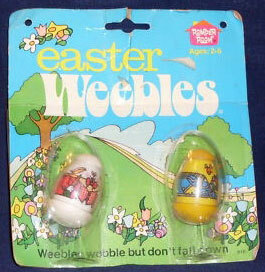 Description: The Easter Weebles set is one of the two Romper Room Holiday Weeble sets. The set includes an exclusive Easter bunny and chic. HTW340 - Easter Bunny - White base, white top bunny figure with a pink jacket, pink bow tie, pink/yellow checkered vest. Bunny holds a carrot in one hand and an Easter basket in the other hand. HTW341 - Easter Chic - Yellow base, yellow top chic figure with a blue shirt with yellow/white designs. Holds a bouquet of flowers in one hand.